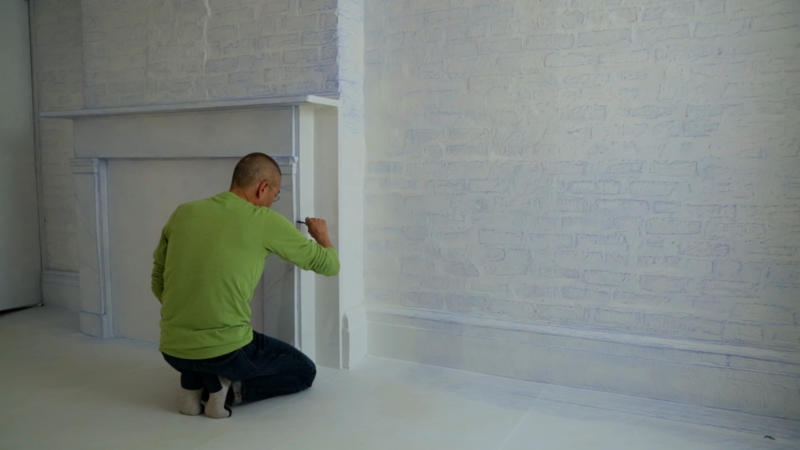 Do Ho Suh at work on Rubbing/Loving in the New York apartment where he lived and worked for eighteen years. Production still from the series Art21 Exclusive. © Art21, Inc. 2016. Cinematography: Ian Forster. Suh’s landlord, who was initially hesitant to rent to a young artist, became a close friend and supported him in making earlier fabric works about the apartment. Before passing away, the landlord gave Suh permission to make this final work: Rubbing/Loving. It serves as a transportable testament to the home’s emotional importance to Suh and the owner’s family. “I try to understand my life as a movement through different spaces,” says Suh, who was born in South Korea, studied in Rhode Island and Connecticut and now lives in London. CREDITS: Producer: Ian Forster. Consulting Producer: Nick Ravich. Editor: Morgan Riles. Camera: Mason Cash, Ian Forster, Semir Hot & Rafael Salazar. Sound: Ava Wiland. Music: Pinch Music. Artwork Courtesy: Do Ho Suh, Lehmann Maupin Gallery & Victoria Miro Gallery. Special Thanks: The Henoch Family.